Module Prestashop which allows you to sell products as defined by mass, length, or volume and with hundreds of attributes without any combinations. Jacuzzis, fruit, doors or fabrics... With Megaproduct you can sell by meters (m), square meter (m2), cubic metres (m3), inches, kilograms (Kg), etc. As well as using more than three measures (high, long, deep...) and introduce measures by millimeters (mm), centimeters (cm), Decimeters (dm), meter (m), kilogram (Kg), grams (g), foot (ft), inch ("")... everything is possible! Links to product attributes, products from other categories or complete categories without doing the traditional combinations that increase the load time of your website. Prices per m2, m3, Kg, fixed prices, prices vary, prices ranges, prices based on attributes, minimum prices... All without restrictions in the calculation of the price, working up to 6 decimal places. There are so many options that we can not describe them all in a single paragraph! Displays the attributes differently than usual in Prestashop, using descriptions, images, buttons, and even videos that accompany the attributes. You can include any HTML element. Don't be shy and show it all! If you use hundreds of combinations to sell your products, now you can link attributes to your products without traditional combinations that increase the loading speed of your website. Simply use the Megaproduct "groups" tab. This way you can show all your catalog packed with products, attributes, accessories, add-ons, etc, without making your customers wait. In addition to saving time in your product configuration, thanks to the functionality "Copy"that will allow you to copy the configuration of a product created in Megaproduct to create a similarchanging only the parameters that are different. You can link to your product attributes and products in other categories (or complete categories) sorted by groups. In this way, customer will display all your catalog at a glance and can choose several items or attributes at once (multi-select). Without a doubt the best way to improve conversion in your online store, is showing all of your catalog. 1) defines how you set up your product: by linear m, m2, m3, Kg, inches or feet. (5) it blocks measures proportionally CUAWhen a client automatically select the high, a proportional width will be generated to the extent you have adjusted the settings, and vice versa. They will just have to introduce measures in the different fields of action (long, wide, deep...) that appear next to the product as well as the amount of product they want with the same or different media. Customize 100% adapted to your clients! Fixed minimum measures / maximum of products and customize the message that appears when the client enter a measurement below or above which you have established. If the customer entered below or above the established measures, will appear a box edited by you that will inform the customer that the measures are lower or higher than those laid down. The procedure is the same whether the product is limited by sections or ranges. "I have no"... now also in your online store. Sets the stock by measures so impossible to serve temporary orders will not be generated. The stock will decrease automatically based on purchases. Does your customer have to wait? Likewise, you can point out day of manufacture of the product as informative data for the client. Communicates few days manufacturing requires the configured product. I am sure that if known in advance, the wait will be more plancentera. A single Front Office facilitates sales. Make it easy! -Increases in the pricing by attribute: Attributes may also increase the price of the product is up to 6 different ways to do it! If your polititca of prices is complex and is not limited to a merely judgement, could confuse your customers and to leave the cart. For this reason, Megaproduct is designed so your customers only have to select the measures, attributes, and quantities. By very complex to be your pricing policy, your customers will not notice it. They have the necessary information from your order broken down with the selected dimensions (length, width, height), the overall measurement (m2, m3...) and the final price. Make it easy and not hesitate to add your order to your shopping cart. Fix ranges is to establish intervals of measurement in order to apply different prices depending on the choice of the customer. Megaproduct identifies what range are the measure introduced by the client and applies the corresponding range price. You can also combine ranges with attributes, so the criteria on the basis of the measures and the selected attribute are applied. They will only have to introduce measures and attributes. Megaproduct will do the rest. After introducing the measures, the final price will be shown. And if is any questions, customers will see measures and prices of each range by clicking on the button "show prices"
-The customer will pay € 5 so if you buy 100 x 150 x 30 80 since the measures found in the first range worth €5. -If you select 200 cm x 100 cm (2 m 2) you pay € 10 since the measures are in the first range with a price of 5€ / m2. The price varies in each range taking into account measurement of the product and the quantity thereof. The price is fixed in each range, taking into account the measurement of the product and the amount of the same total as the range. With this feature you can set prices by "measures boxes"
Indicates the number of meters which corresponds to a box and fixed prices per box. 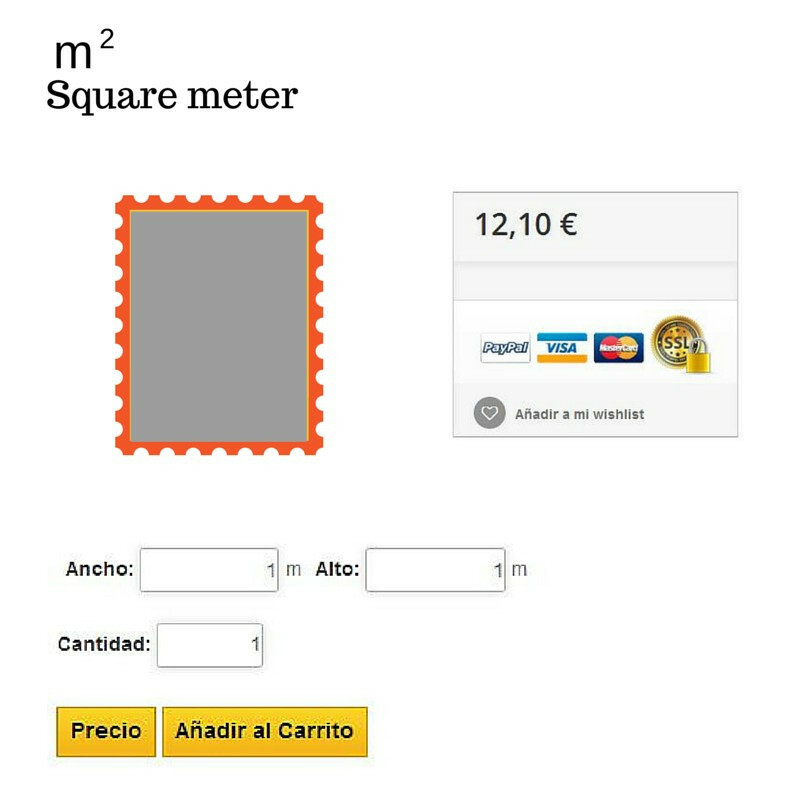 If your box contains 5 meters and has a price of 3€ / box, the customer selected 2 meters will pay a box, i.e. € 3. In the case of exceeding the measures corresponding to a box, will apply the price of an extra box, so if you select 7 meters will pay €6 (2 boxes). How does the price of your attributes to the final price of the product? EJ. If a curtain rod depends on the width of the fabric and the bar has a price equal to "the wide price * 2" just insert the formula W (width) with value of 2. In this way, the module multiplied by two the width of fabric inserted by the customer to calculate the corresponding price of "curtain rod". The price of the attribute is a percentage of the total price of the configured product. You can set a minimum billing price to the customer to pay a minimum amount of money regardless of the selected means. Your customers will see real time as it varies the total price according to the measures introduced. Whenever they introduce measures, the price will be updated instantly. 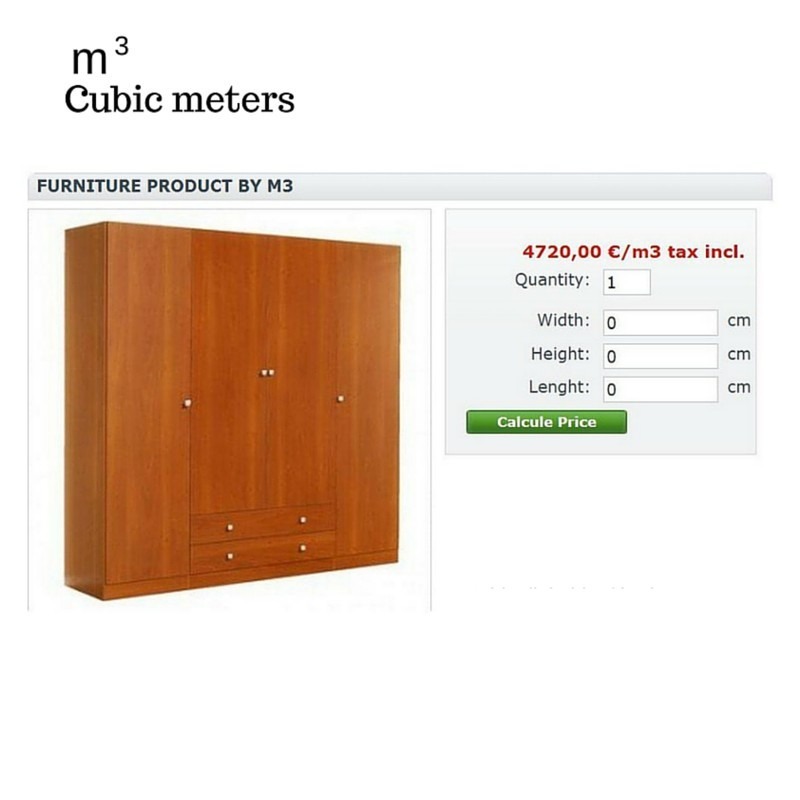 Indicates how much weight unit of measure (m, m2, m3...) to implement the transportation tariff corresponding to the dimensions chosen by your customer. If you also include attributes that increase the total weight of the product, you can add the weight of the attribute for the computation of the total weight. The customer will know what transport rate applied. Without a doubt the best way to avoid uncomfortable surprises for the customer. Unlimited combinations of attributes by "Groups"
Manage hundreds of combinations in Prestashop without problems, was impossible... so far!! When attributes come through the eyes out on the cart! Improves the presentation of attributes by changing the name of the attribute group, adding descriptions of attributes, as well as adding videos and pictures, i.e. any HTML element. In addition the multi-language option, allows you to display the message in the language you prefer. The customer buys the product which sought, and on the same page of the product you can buy articles of other categories related to each other. Nothing like selling a camera SLR and put USB drives on the same page without having to go out and look for other categories. -Wetransfer: Now your customers can send all their heavy files, such as images of high quality, using wetransfer. WeTransfer will generate an identifier that will be added to the customer's order so that you can download files easily. EJ. He sells timber and "painted" attribute only be chosen if the client introduces measures less than 1000 mm. When customer enter a half higher than 1000mm the attribute will be hidden. So the customer can not select the "painted" attribute. Does your Online Shop personality? Prove it! And if they have doubts, a help icon will guide them in the buying process. Edit the text of the error message that appears when the client enters the wrong measures or off-limits. You can also include videos, photographs (i.e. any HTML element) in your error messages. You can also enter help messages in the form of a tooltip in groups and attributes. When the client passes the mouse over them the message that you have configured. Maybe your customer bother when there is no stock or select measures to lower / higher than the established... why not include a fun photography in the error message? Your customer will not take insurance as well is so bad. * Active function "price per ajax" so the customer to see in real time how you change the price of your product to introduce various measures and click on add to cart when you are finished setting up your product. A) add to the cart directly: the client configures the product and adds the order directly to the cart. (B) obtain the disaggregated information and add to cart: customer configured product, click on calculate prices for information disaggregated on targeted measures and the total amount. Finally click on the button "add to cart"
-in a box that floats down the page or not show nothing. Product buttons: inside the box "add to cart"
You can show groups of attributes for the customer to see them at a glance or divide the selection of attributes or products from other categories in steps (technical wizard). You may simply indicate in how many steps are displayed the groups to complete the configuration of the product. On the same page of the product, your customers will make click next / back to scroll through all the groups of attributes (or other products) up to the time of "add to cart"
Why not sell computers a la carte in a same product page where the components are products of a category? 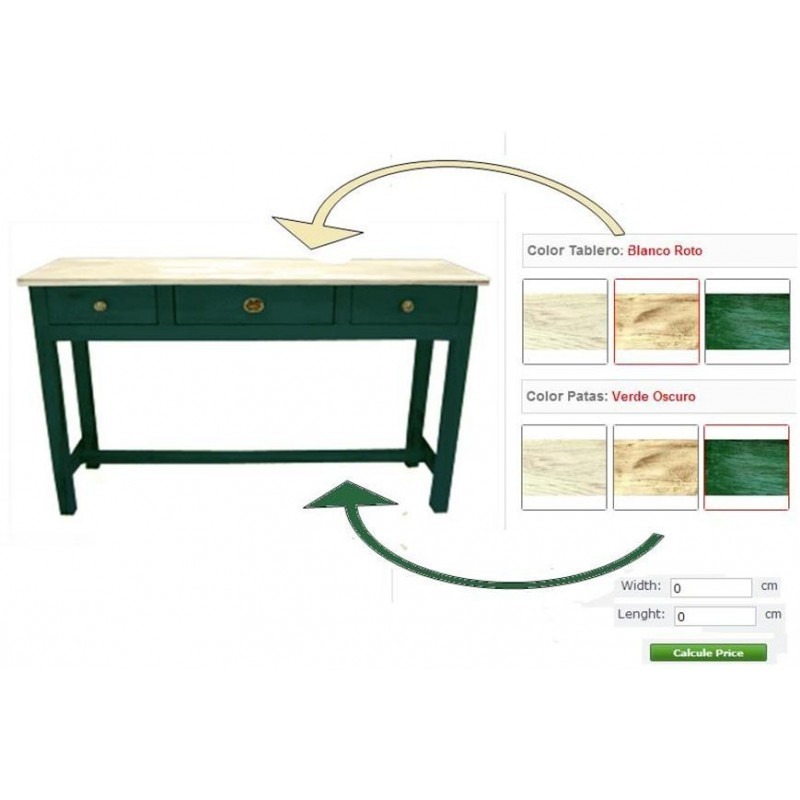 Includes images of attributes for display in the "base" image of the product. When the client select an attribute, the image will automatically change. Do you need a specific funcionliad to sell for measures and believe that Megaproduct does not? -Dependent attributes of other o independent. -Multiple selection of products and attributes. * Configuration option + video: previously a plus the difficulty of the product set up and the time required. * So that the module can display in mobile, you must use a template responsive and, in addition, turn off mobile view on the subject. If you work with importers or have to compulsorily use PrestaShop attributes, consult us previously. Why do not the attributes appear in MegaProduct? Buenos días, Tenemos una tienda funcionando con los atributos por defecto de Prestashop y queremos que sólo algunos de ellos funcionen con las opciones avanzadas de Megaproduct. Es posible mantener algunos productos con los atributos del módulo y el resto con los atributos tradicionales o, una vez instalado el módulo, es necesario que todos los productos funcionen a partir de él? Gracias. Buenos días, Sí, es posible configurarlo como dices ya que puedes añadir a Megaproduct sólo los productos que quieras. Además, Megaproduct también trabaja con los atributos por defecto de PrestaShop, aunque no es necesario generar combinaciones (una de sus grandes ventajas). Por otro lado, si lo que quieres es usar las combinaciones de ciertos atributos de prestashop y añadir el producto al módulo para usar otras opciones también es posible, ya que puedes crear una combinación en el módulo que sea dependiente de la combinación en PrestaShop. Todo dependerá de lo que mejor se adapte a las necesidades de tu tienda. Saludos. Hola, estoy interesado en el modulo para la venta de productos en centímetros lineales. La idea es que el usuario no calcule cuanto es un metro cincuenta centímetros, sino que este ponga la unidad y los centímetros y se refleje el resultado. Tendrán algún demo o pagina de un tercero que lo haya implementado en la venta de telas. Buenos días, El módulo megaproduct tiene la opción de precio por ajax, de tal manera que el precio se va actualizando automáticamente a medida que el cliente va seleccionando las opciones. Además, permite aplicar una medidas predeterminadas y/o añadir medidas personalizadas a cada cliente. Aquí tienes una demo de ejemplo: http://demos17alabazweb.com.s116-224.furanet.com/megaproduct/es/metros-lineales/38-producto-por-metros-tela.html En este caso el cliente puede escoger entre comprar el rollo completo de tela o solo un trozo. Si decide comprar solo un trozo, puede elegir entre las medidas predeterminadas o seleccionar medidas personaizadas y escribir el mismo la cantidad. También puede escoger el color. El precio va cambiando a medida que hace la selección. Saludos. Buenas tardes Dani, Efectivamente con este módulo puedes aumentar el precio del producto en función de los atributos que el cliente selecciones (serigrafía y tipo de serigrafía, color, talla... lo que necesite). Además, puede establecer rangos para que el precio disminuya a medida que aumenta la cantidad. Un saludo. 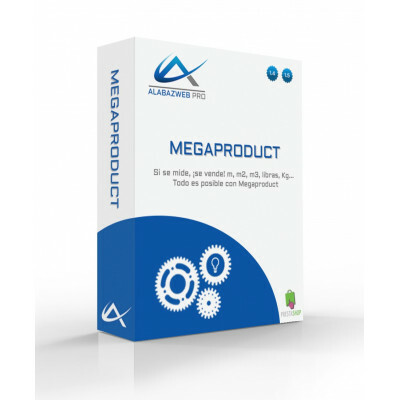 Buenos días Javier, Sí, MegaProduct es compatible con su versión de PrestaShop. Un saludo. Buon giorno, Sì, con questo modulo si può vendere i prodotti a peso. È possibile vendere prodotti da grammi, chilogrammi ... Qualunque cosa avete bisogno. Un saluto. Hola, ¿Es posible usar el módulo para calcular el precio de piezas complejas que tienen 3 o 4 medidas + profundidad (por ejemplo un trapezoide)?, donde el precio se calcula en función de una fórmula diferente para cada una de las piezas. Muy buenas, tenemos otra duda acerca de las funcionalidades de este módulo. Tenemos el caso de un producto (camisetas) que según tramo de cantidad y atributos (tintas y cliché) se le añade un total al pedido, pero a partir de cierta cantidad ya no es al total, sino a cada camiseta. Por ejemplo, de 50 a 99 se le añade al total de las camisetas el precio de cliché y precio de 1 tinta base, pero si se compran 100, se le sigue añadiendo el cliché al total del pedido, pero el precio por el atributo tinta ahora sería por camiseta pasando de 24€ precio total pedido en el tramo 50--99 ud. a 0,24€ precio por camiseta en el tramo a partir de 100 ud. Espero que se entienda. Saludos y gracias. Hola, ¿en la opción de producto configurable por capas en PNG no hay opción de guardar la imagen final? He visto que se añade al carrito pero la imagen base y luego las opciones elegidas en la descripción del pedido, pero no la imagen final que se ha compuesto. Otra duda, imagino que tampoco habrá límite para añadir capas ¿verdad? Saludos y gracias. Hola es posible aplicar descuento segun el numero de metros cuadrados, es decir entre mas metros cuadrados escoja menor sera su precio. Buenos días Si, tan solo tiene que configurar diferentes rangos, indicando qué precio tendrá cada rango de medidas. questo modulo è compatibile con tutte le versioni fino alla Prestashop 1.6 4.6.? Buenos dias, existe un apartado dentro del módulo que se llama importar, ahi tiene archivos de ejemplo para que vea con que formato se tiene que importar el csv. Muchas gracias y saludos! questo modulo va bene per la versione 1.6.0.8 ?? Così, il modulo è stato adattato a tutte le versioni di PS 1.6. Grazie e saluti. Buenos días, Efectivamente, el módulo le serviría para vender sus productos del modo que indica. Si lo desea, puede facilitarnos los datos concretos de alguno de sus productos (incluidas las posibles combinaciones de atributos y su influencia en el precio final) para poder mostrárselo configurado en nuestra demo: http://www.demosalabazweb.com/megaproduct16/es/ Quedamos a su disposición y a la espera de sus noticias. Gracias y saludos. Hey alabazweb.com Owners! I have a Question, is a German or English language Pack in this Modul (Linearmodul pro M2, M3) ?? Hello! 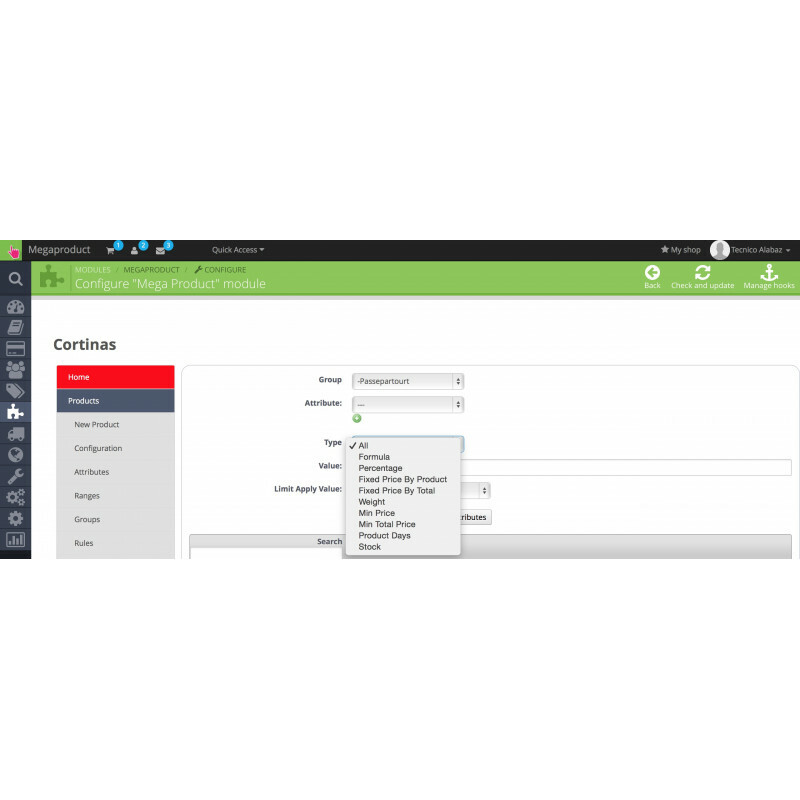 This module can be translated automatically from the configuration itself to any language that you have installed in your store. We welcome your news! Thanks and regards. Hello, I would like to know if this module is compatible with Prestashop 1.6. Hello! Yes, it's compatible with Prestashop 1.6. Thanks and regards! Hola! Sí, puede configurar el producto Reforma Cocina como m3, de modo que tendría tres campos de introducción: Metros cuadros de suelo + metros cuadros material pared + metros lineales rodapié + Desde atributos le puede meter un precio con la fórmula: selección extractor (opcional) + selección frigo (opcional) + + selección horno (opcional) Esto serían grupos de atributos y, dentro de cada grupo, serían atributos los hornos, frigos y extractores. Quedamos a su disposición y esperamos sus noticias! Saludos. Hola! Tras validar su compra tendría disponible la descarga de un archivo zip en el apartado Mis descargas de su área de cliente en nuestra web, así cómo la posibilidad de generar la clave de activación para el dominio que usted indique en el apartado Activación Módulos. La adquisición del módulo incluye una sola licencia que se activa para un sólo dominio. Para poder utilizarlo en otras tiendas, deberá adquirir licencias adicionales a coste reducido (20% del precio del módulo). Esperamos sus noticias! Gracias y saludos. Hello, Your module is very interesting air! Is it possible to specify the number of sides on which we will indicate a measure (Trapezoid, rectangle, octagon ..). And specify a number of options, such as drilling (diameter, coordinate)? Hello, Yes, you can use the number of sides you need for customized products and add all combinations of attributes you want. If you need assistance during the module configuration, you only need to send a ticket to support from your client area. Thanks and regards. (2) is shown in the results window boxes necessary when working with the field configuration boxes. (3) is added a new option to the output window to be displayed anchored to the footer of the page. Error "undefined variable MPClass" php in the new copy AdminMegaproductCopyController controller. Copying attributes between product groups. Inclusion of field position that allows to copy the group in a given position. -Display enhancements in "show groups in" the "custom" option. -Fixed problems with prices of attributes and the logical operators. New logical option on the tab attributes to indicate if the selected attributes must be selected all for the customer to have applied the rule, or only one of them, this makes it easier to create a price to several attributes with a single rule. -New option that allows you to choose in each group of a product whether you display your information in the shopping cart, order, invoice, etc. -It allows to work with combinations of a group of attributes and listings of quantities. In this way various combinations can be sent to the cart, the stock of products considerably and adding one product with different combinations to the cart. -New configuration option that allows you to indicate whether the prestashop item card discount applies to the base price, if used product in the megaproduct or only as the total amount of the discount. -Added that if a group is created as and puts a title that is displayed in the list of rules and will locate easily. 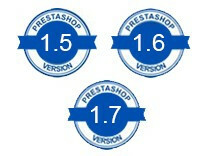 -Launch of the module for Prestashop 1.7. It includes all upgrades from previous versions. -Is displayed in the results window boxes necessary when working with the field configuration boxes. -Added a new option to the results window to display it anchored to the footer of the page. -It allows to work with combinations of a group of attributes and listings of quantities. 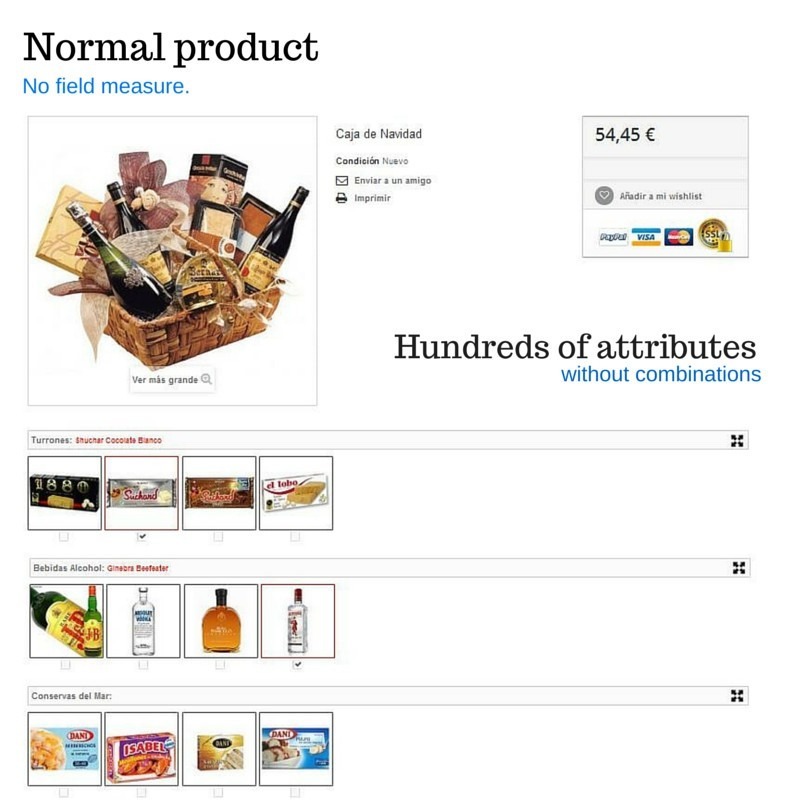 In this way different combinations can be sent to the cart, eliminating the stock of products and adding one product with different combinations to the cart. -New name of the versions. It includes all upgrades from previous versions. Added the ability to select parts you want to duplicate to duplicate a product. 1) added the ability to limit the minimum and maximum amount for each attribute of a group of listings of quantities. (2) the tab attributes adds a new rule to be able to limit the measures according to attribute. 3) added descriptions explanatory of the different type of attributes rules and different types of ranges that can be used. (4) on the tab attributes add filters to display the available rules by its type (prices, configuration. (5) in the rules tab shown in addition to the id of the Group and attribute selected its name. Added to the rule of hiding by measures also the quantity field. 1) change measurements by default according to the selected attribute. 2) can assign rules tab attributes depending on the customer group. (3) new limit tab attributes by total price. (4) now files to load personalization fields allows you to upload several files and delete them before adding to the cart. (5) new fields of General options to indicate the maximum size of files to load into the fields of personalization, and be able to indicate which types of files you can upload. 1) new group type "Product as attribute" which allows you to use the product categories to display them as attributes, and when added to cart is added only a product where the products are the same attributes. (4) new choice for show fixed price attributes of groups, if we deactivate it will improve the page load if we have many groups and do not want to display the fixed price for each attribute. 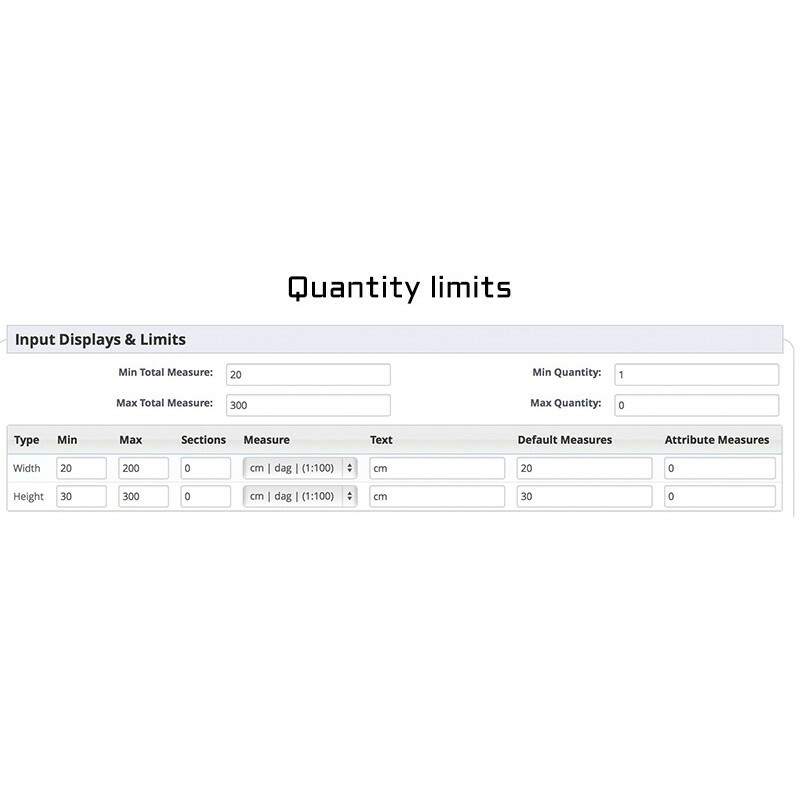 (5) new option that allows you to indicate to be sent to the cart only 1 in quantity although on page calculate another quantity, so we can use the limits of quantities but only anadirmos an only product. (6) improvement in performance to load less information on the page if it is not necessary, this has been revised and caching certain repetitive queries. 1) added new form of Show Combo textures groups. (2) a general option is added to enable groups in URLs. (3) is added in layers the possibility of indicating in addition to id attributes to display the layer those ids of attributes that will not allow to be displayed. (4) added the ability to duplicate a layer and modify only some attribute and change the image in a way more quickly. (5) add css to tables listed so they display better to distinguish the different rows. 1) new field group on the tab Id attributes to apply a percentage only on prices that have the same id. 1) it adds the ability to export the table tab attributes to edit the data in an external application and re-import the data. (2) add a checkbox in the table's attributes to selectively delete massively. (3) properly creates the selected attributes to duplicate an order. (5) properly hidden by selecting fields of radio buttons to apply rules of hide. (7) refund the VAT discount price. 1) adds a new option that allows you to indicate whether you want to use the price of the product in Prestashop to perform the calculation of the final price, this can be used as a fixed price or the price of the measures. (2) Solventado problems in the calculation of the price when a minimum total price is used. (2) allows you to copy products indicating several id products separated by commas, to be able to copy a product to several more quickly. 1) new choice for container type groups, allows to group one within other groups to generate the html. (2) add the attributes of type negative percentage discounts. 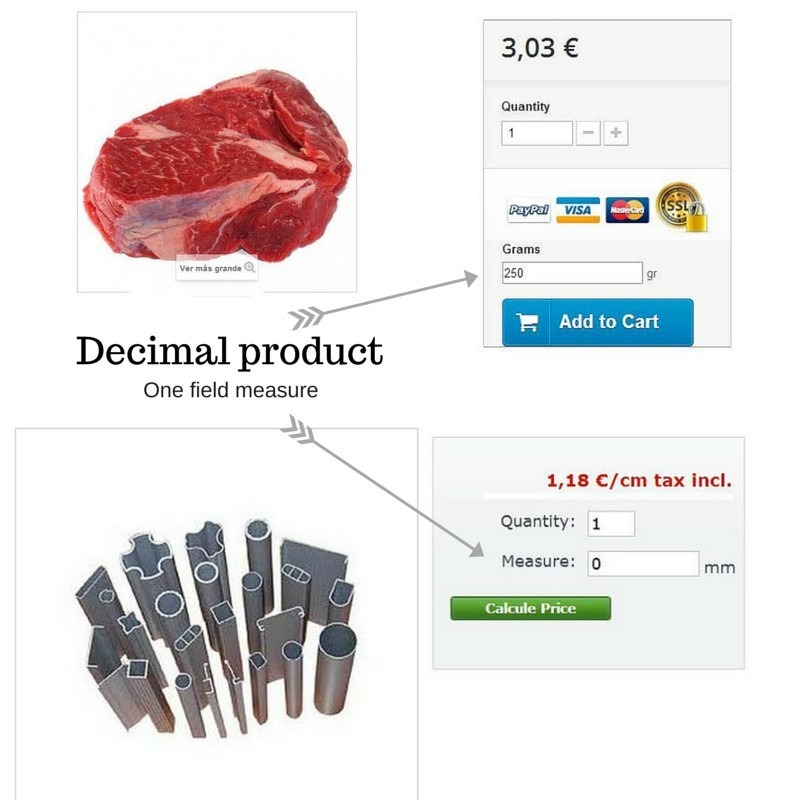 (3) correctly changes the price in the fields of measurement. (4) enhanced the choice of minimum price to add to cart. (4) is added to the formula attribute use DW, DH, DL variables to replace the measures by default from the settings. 1) is added to the calculation of fermula library using conditional, i.e. If the first parameter is true then ejecutaria the second parameter, and but executed the third. (2) Add friendly url for the image generated with the layers. (3) add functionality required to work with a reports generator module this module further, making use of the components of the module. To calculate the stock that allows to add to cart, add that you take into account the other equal products so that when it comes to adding the quantities checked if they exceed the available stock. 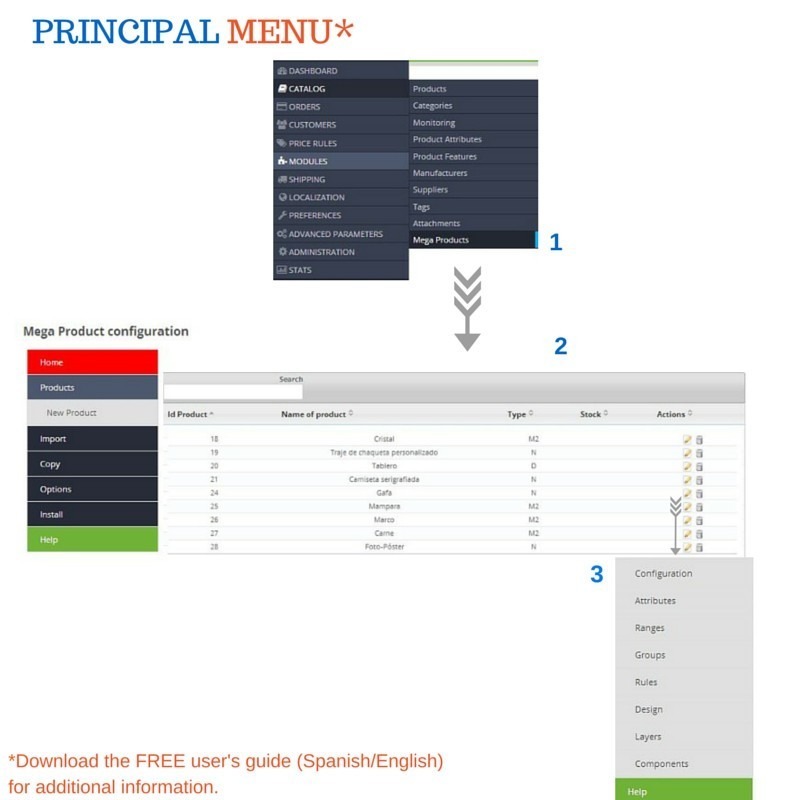 1) apply the settings of a particular product configured in a megaproduct to all products in certain categories. (3) the images zoom icon now comes to put on the image in question. (4) correct running of the option Add listed amounts amount. 6) proper functioning of the type rules disable fields. -It allows to correctly calculate the weights using the increase in weight from the tab attributes. 1) it excludes increases by attributes when you check the total price with the minimum total price. (2) depending on the attributes minimum quantities properly. 1) from the general settings you can choose whether the module internally to work in metric or inch systems. This makes that all the systems administrator settings turn environment that system, so prices and total calculations will be based on what the client select. 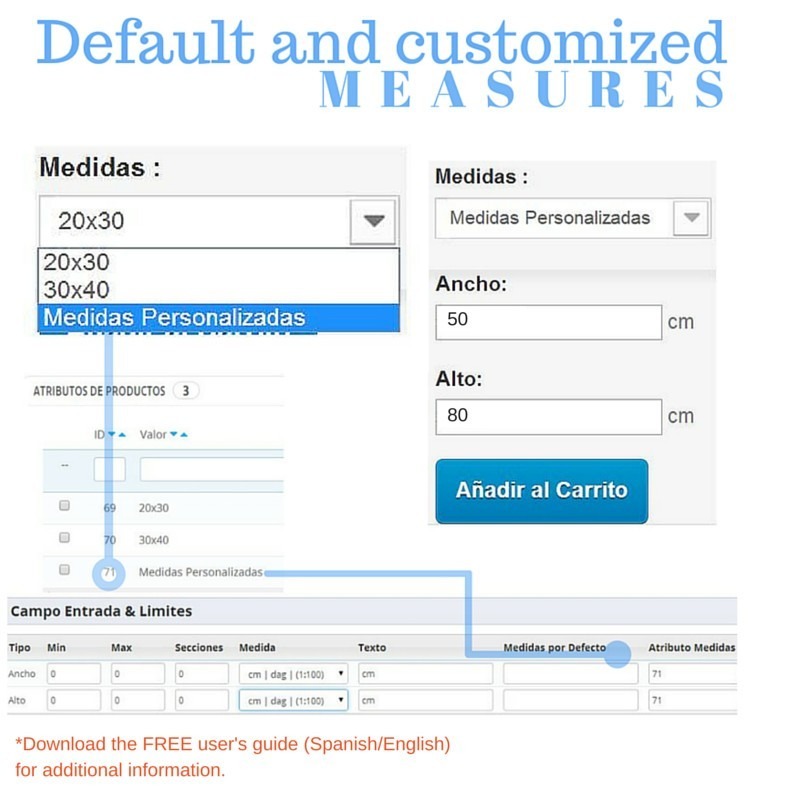 (2) allows you to choose in each product as the customer must enter the data: meters, feet and inches or be the customer who choose as you enter them from the product tab. 1) reallocate properly groups IDs rules and tabs when copying groups of a product to another. (2) displays the groups tags and attributes from the product in the cart. -Are added to the url parameters of the selected attributes. The url can be passed to another customer, and when you access those attributes would already be selected. -Added the possibility that change the minimum and maximum amount at the attribute level. -New option to allow only multiples of the minimum quantity to add to cart. -Properly displays the customization products. -Displays the option to calculate the price for days depending on the attributes when the advantage of information not shown before adding the product to the cart. -Added tab attributes a new type of limit according to the measurements of the total by number to find out if you can apply the rule. 1) adds a new tab type attributes 'Price Total minimum' that allows you to change the total minimum price to Bill for a product depending on the selected attribute. (2) adds that you can display the price for groups radio button, buttons and combo if it uses the tab attributes type 'Product price' and show prices at the group. 1) adds the ability to use rules to hide other attributes and groups based on the total measurement. 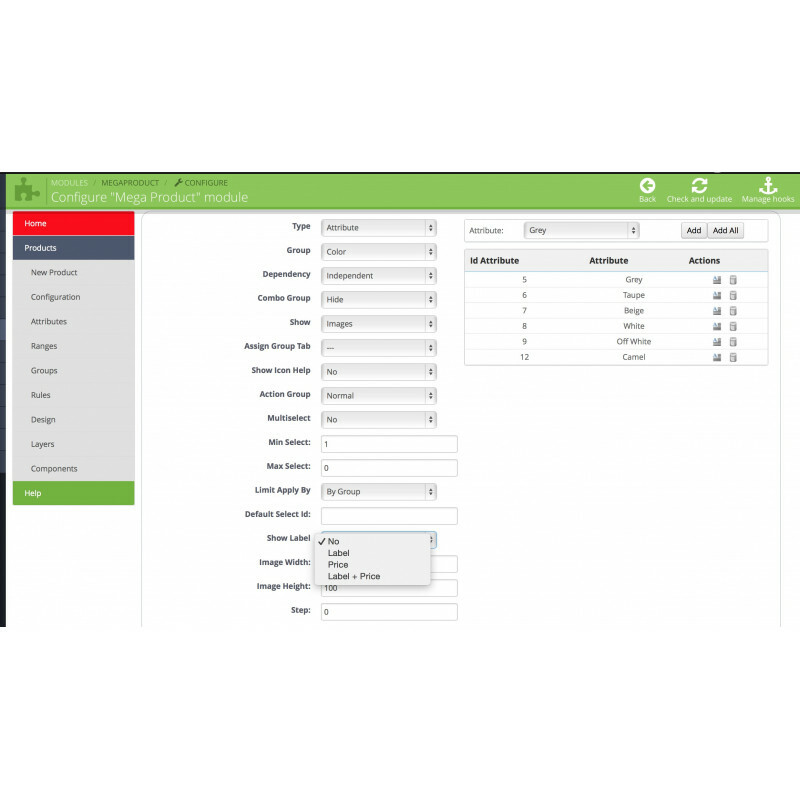 1) module allows you to limit for minimum and maximum quantity which the client asks for. Eg: Can indicate that at a minimum we have to buy X products and only maximum you can shop and products. (1) add an option in the settings so that the measures are proportionally blocked. So if you change the width, height is changed to initial ratio automatically. (2) add a new kind of aid in the form of tooltip both at group level and attribute. -Added a new type of rule that allows to select an attribute to be choose another attribute of a distinct group. -Lets you deduct the stock of meters to make an order. 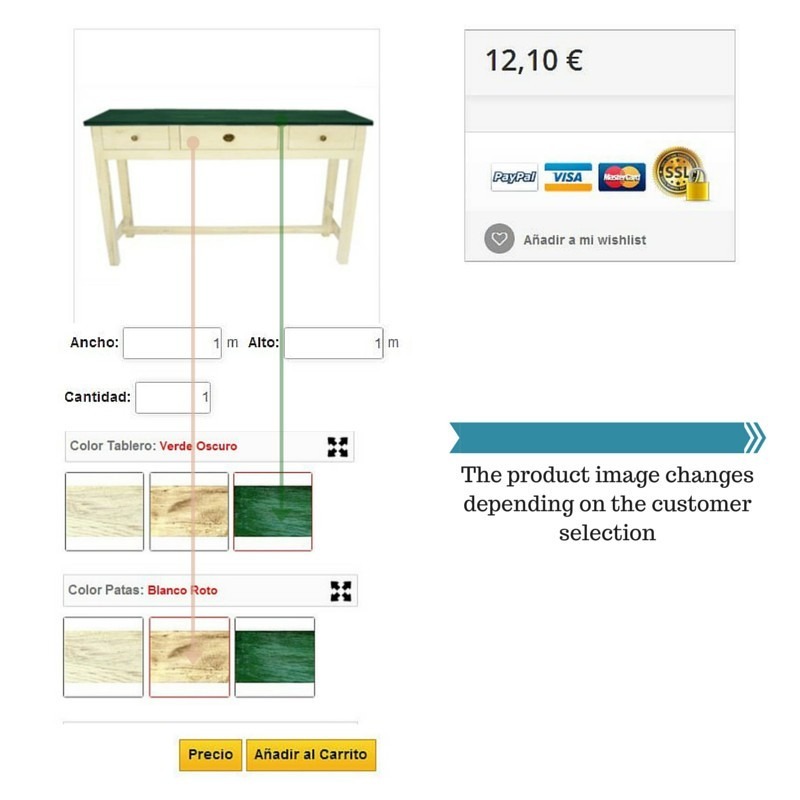 -Compatible with PS 1.6.1: shows the products of m2 at checkout during the process of payment with the getProducts method. 1) it allows to import files as csv. 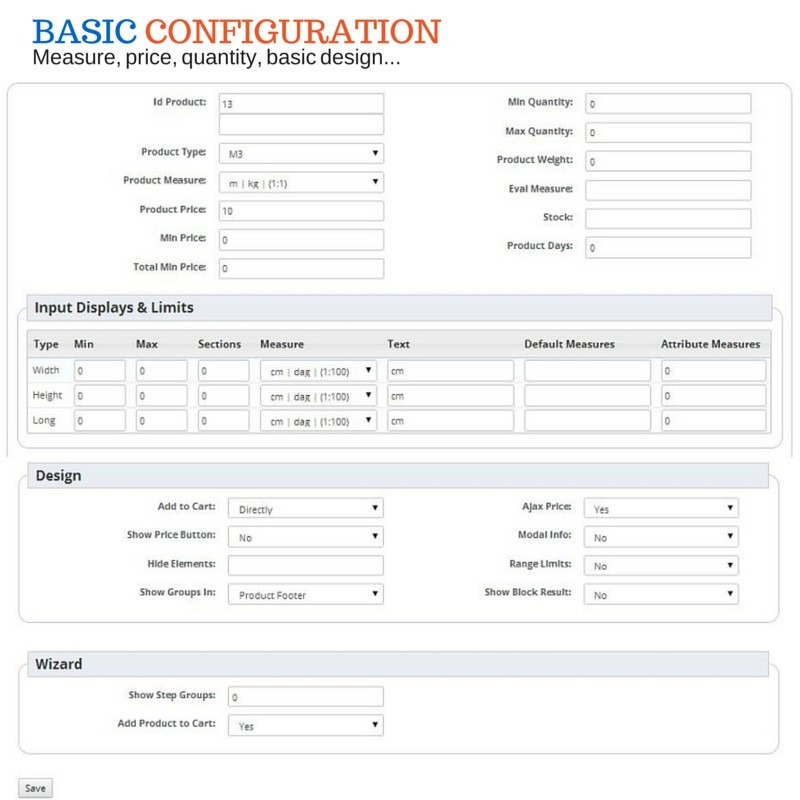 From the tab import you can select which fields of the general configuration of a product you want to import. Thus we can import csv files only with prices, stock or any other needs. (2) now, if the button "add to cart" on products from the list, is displayed when the customer add product to the basket catch all attributes and values by default you have configured in the module. -It allows to specify a css class to be applied to the container of that group. You can manually change the css and adjust your design. -Added a field id allowing indicate which is the id of the attribute or product selected by default to loading the page or add to cart from the listing. -Added the possibility that indicate a character limit when using a field of personalization. (4) in the general settings, adds a field boxes allowing you to indicate how much is contained within a box. 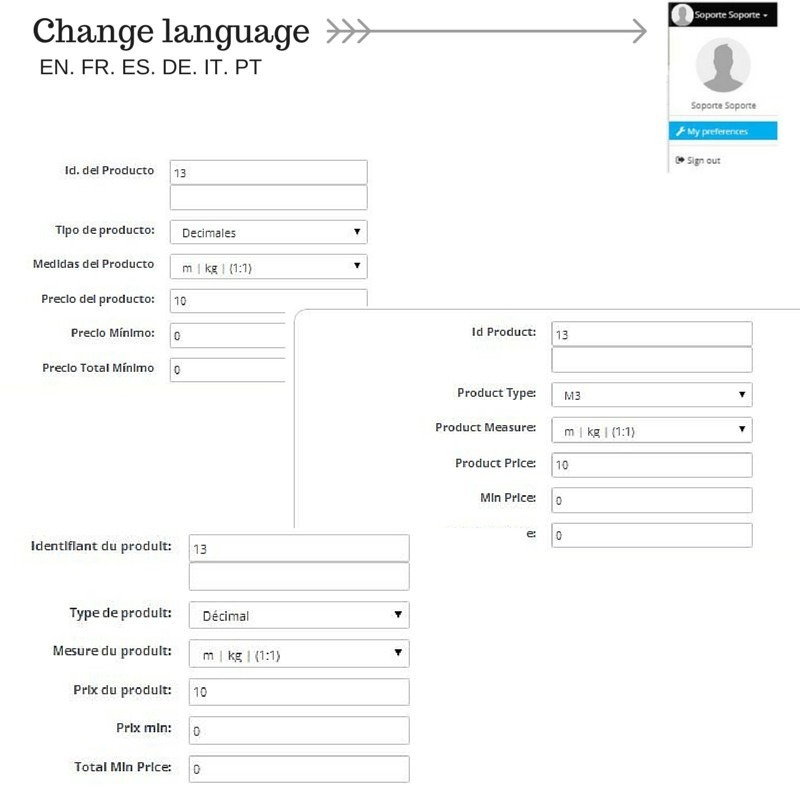 In the configuration you can climb from the importer's form fast. It is focused on Web sites that sell products by m2 boxes but want the client to indicate how many m2 wants to use and always will you necessarily top boxes. 1) are added icons for each file type in the option of customization files to load. (2) add to the possibility of using the variable Q (quantity) in the formulas. (3) new attribute "stock" that allows to work without action and assign a stock to an attribute that will deduct the total stock. (4) Cache in several functions of attributes to improve the rendimiento.y reduce the number of queries. Groups of attributes in the form of "list of quantities": you can limit the number of attributes selected in function of the group to which he belongs, the other groups or depending on the attribute itself. 1) impacts of the attributes. In the "Attributes" tab is added selector that allows you to select the bound to apply the rule. It can now be selected by quantity, measures total, wide, high, long. You may not select any attribute so that the rule is always applied. (2) tab groups: When working with lists of quantities and you want to limit, is added the possibility to indicate if that limit applies to each attribute or to the sum of the group attributes. (3) components tab: added two more information (price and weight) to a component. the weight and the price component to be added, will affect final calculation of the weight and price of the product. -Added new tab components that allows you to indicate the components that are part of the product that we are riding as well as their measures, this is merely informative and are vera when the customer add product to cart. -Added fields personalization in email and invoice shipments. Review/update: 12/09/14 v.5.2.5 improved programming. Review/update: 07/07/14 v.5.0 added new functionality: allows you to work with layers and assign partial png images to mount a final image according to the attributes that you select. -New options for customizing fields that allow you to create files in the product order. -Allows to indicate quantities of a particular attribute and, since the tab attributes, put a price on the product which is multiplied by the amount of that attribute that is needed. -The tab attributes adds a new field which allows to limit for quantity when you run this rule of attribute. Review/update: 13/06/14 v.4.9 added the possibility of indicating fixed or custom measures both on the product as in the groups of attributes. Review/update: 22/05/14 v.4.7 added new functionality and improvements in the installation process: working with wetransfer. Review/update: 04/04/14 Compatible with PS 1.6 v.4.6. Added the possibility to work with more than 3 steps. Improvement in the multiple selection of products and attributes. Review/update: 7/02/14 v.4.5 new features at the level of design, functionality and usability. 1) we can show groups in the footer of the page of the product (productFooter), or to the right of the image of the product (extraRight). (2) added the possibility to show results with everything the product selected customer has. You can select if not shown, if it is displayed on the page or if it is floating, moreover, when it floats you can move to the side of the page you want. 1) the positions of the groups and attributes making drag & drop can be changed. (2) on the tab rules has improved the selection of item with a contextual help which you can select. 1.) added the ability to create groups of type customization so the customer can customize the product with text fields, textarea and combos. (2) lets you create groups of type tab and assign other groups within this display all of these in the form of tabs sorted. (3) the module also serves to work with normal products that do not require custom fields and take advantage of groups tab to add an infinite number of groups without having to add them as combinations and be able to increase the price according to the attribute that Select. (4) it allows to indicate the categories group show which products in each category. (5) it allows to add multi-language text before and after the price. 1) added the possibility of using the multi-select in the Options tab groups. -Insert html code at the beginning and at the end of the attribute groups. (2) new rules tab which allows you to hide attributes and attribute groups according to the attribute that you select, and can create groups of attributes showing other groups depending on what you go by selecting the client. (3) added help in the module through video tutorials for each of the screens that the client is to facilitate the learning of the module. (4) new tab installation that checks if you have installed everything you need to run the module correctly. (5) now allows you to enter contextual supports each group of attributes, this will be displayed directly around the group or with a help icon that the client can select to show you support modally. (6) in groups is allowed now also add the fields of measures putting separately the width and height with supports so that the client knows how to enter data. (7) it allows editing of the ranges of attributes, without having to delete them and create them again. (8) — indicate a maximum and minimum allowing to select when we activate the multiselections. -Added the possibility of strings multilingual next to the price of the product. -New features that will give a greater usability for the customer and more possibilities of configuration for the administrator. It allows the possibility of modifying the way of showing the attributes of the product, even to wizards with attributes. Allows you to select among different ways how the attributes are displayed (combo, images, buttons, list of quantities), as well as the possibility of ordering the position attributes and groups. 1) can also add product categories to the wizard and can sell, for example, computers a la carte where each of the components are products of a category. (2) is added the possibility to create normal products that do not rely on action, but need created in form of wizard or the sale of the product by assigning a fixed price per attribute instead of by combination. -You can change the formula of calculation of measures. -Added the use of stock measures, if needed. -Automatically calculate the price of the product by ajax. -Being able to hide certain page html elements. -Button that shows how attributes and ranges prices affect the price.